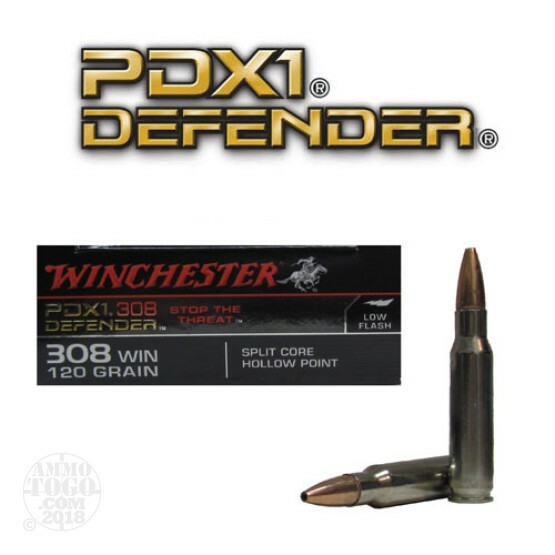 This is .308 Winchester PDX1 Defender 120gr. Split Core Hollow Point Ammo. Specifically designed for modern sporting rifles, PDX1 Defender .308 with Split Core Technology provides the ideal balance between expansion, retained weight, and penetration in personal defense situations. Winchester developed Split Core Technology "SCT" to deliver massive initial trauma with ideal penetration to create the ultimate rifle load for personal defense. Nickel coated brass cased, boxer primed, non-magnetic and non-corrosive. This ammo is packed in 20rd. boxes.